Finally after years of being out of print, its back and on a lovely slab of wax. 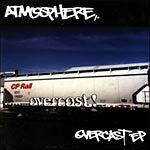 The first Atmosphere EP, Overcast which includes the songs 'Scapegoat' and 'God's Bathroom Floor.' Definitely an essential for any Atmosphere fan. Produced by ANT except: 8 by Stress.